So I finally got around to visiting Fiona Banner's installation at Tate Britain. And it's one of my most science-fictional experiences this year, and way more Ballardian than many of the pieces at Crash, the exhibition of art reflecting Ballardian themes and tropes staged by the Gagosian gallery. Banner's installation is audaciously simple. A surreal magic trick. Two fighter planes are stranded in the atrium space of Tate Britain's Duveen gallery. A Jaguar is stranded upside down, paint stripped off its fuselage to leave a mirror finish. And a Sea Harrier is suspended nose-down from the ceiling from a single cable that pierces the skylight above, hanging like a trussed game-bird a handful of centimetres off the floor, its fuselage brushed with a faint pattern of feathers. Banner has form; she was commissioned to decorate the Tate's Christmas tree a few years ago, and hung it with scale models of every fighter plane currently in service. But this is a major step up. 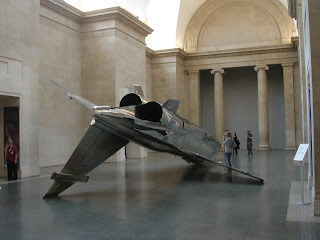 The two planes are bound, prone, helpless, yet they dominate the gallery space. Visitors tiptoe around them, marvelling at the gape of their afterburners, their lethal lines. There's a feeling of trespassing in the trophy room of a machine predator, or some futuristic armoury where decommissioned war robots crouch, waiting for their go codes, or a battlefield littered with machines beyond human comprehension. Children had a simpler, more innocent response, mind you: time and again they raced up to the suspended Sea Harrier and threw themselves under its nose, giggling and amazed at their own daring.